Every once in a while, I find myself at the local Starbucks buying a drink or even grabbing a snack. Intrigued with this thought, I went home, researched online, and sure enough, there ARE ways to get free Starbucks gift cards. And what I found was that, yes, it will take some work on your part, but there are times when it’s as easy as 1-2-3. It really depends on how much you’re looking for. In short, nothing in life will come free, but if you don’t mind investing a few minutes of your time, then a free gift card could be yours. In today’s post, let’s explore the many ways you can get free Starbucks gift card, and yes, it’s spam free and I promise you it’s 100% legit. Survey Junkie will reward you for participating in their program, essentially answering simple survey questions and earning points as you do so. Rewarding you in points for every survey you complete, you cash out for a variety of rewards, including Starbucks gift cards. And like most survey companies, don’t plan on getting rich, but you can make $20, $30 or even $50+ per month if you log in every day and qualify for the surveys. Just make sure you pay attention to your e-mail and try to log in as much as possible. Honestly, I use Survey Junkie personally, and I make about $25~ a month just by logging in a few times a week and answering some questions. If you want, check out my detailed review to learn more about them. In short, they are highly recommended. To become a member, follow this link, validate your email address and confirm that you’re older than 13 years old. Once in, you will be asked to fill out a short profile that’s used to help match you and qualify you for future surveys. As with any survey website, always make sure you fill out this profile in depth as it’s the best way to increase your chances at landing multiple survey opportunities. Joining Survey Junkie is 100% free and can earn you Starbucks gift cards in as little as a week. Remember, there are other redemption methods as well if you don’t want the Starbucks gift card. If you don’t mind setting aside a few minutes of your day, then you will find it’s quite easy to earn a $5 or even $10 gift card by the end of the day. Paid out in what’s known as Swagbucks or “SB,” a $5 gift card, for example, would cost 500 SB, and to earn this, you would be quite amazed at how FAST you can. 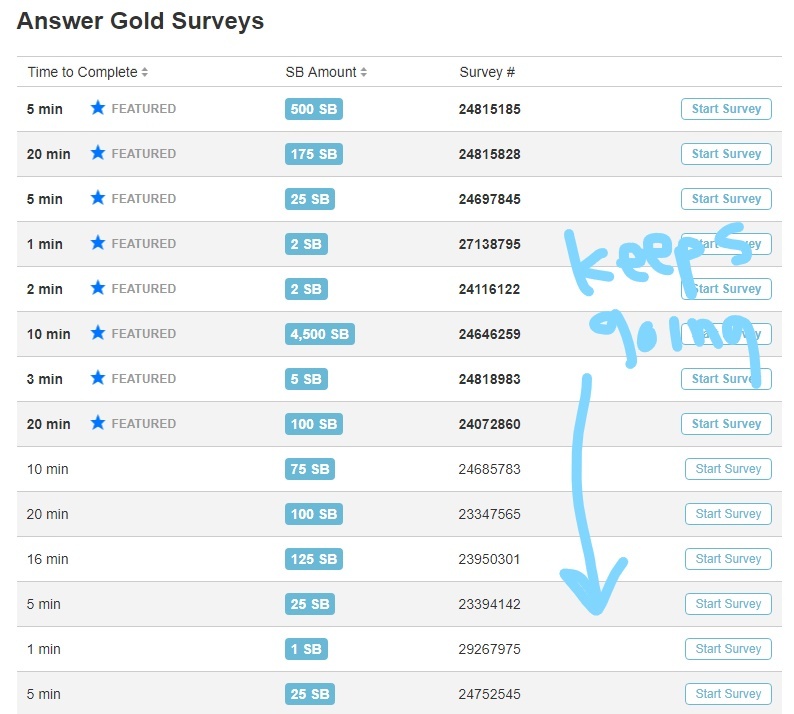 As long as I qualified for these surveys, I could earn more than 5,000 SB in a few hours or about $50 in Starbucks gift cards! In one instance, one survey was a quick $5 gift card. Not too bad, right? In my opinion, Swagbucks is one of the easiest ways to earn money on the side and Starbucks gift cards are not the only reward you can choose from as the company has hundreds of redemption offers, including Visa cards. If you do plan on signing up, I would focus primarily on the surveys since these offers tend to pay the most and can earn you the most SB. While the other offer opportunities can earn you Swagbucks, it just didn’t seem as much as the surveys, but I will let you play around with the website to see what works best for your time. If you haven’t signed up, consider doing so as the company almost always offer a small sign-up bonus, sometimes as high as $10. Worst case, if you don’t like what you see, you can always delete your account and move on. Inbox Dollars works in a similar way to Swagbucks as well, offering you a variety of options to earn points, from completing surveys to watching videos to playing games and completing offers. Now, like Swagbucks, I really recommend you focus on the surveys section here as this is where you’re going to earn the most points. Plus, the more of these survey panels you join, the easier it is to earn some decent money throughout the month as you will have a ton of survey offers sent to your inbox. And yes, if you’re wondering, as one of the rewards, Inbox Dollars does offer a free Starbucks gift card as an option once you earn enough points aside from cash. You will need at least $30 in rewards to redeem, but the company often offers a $5 sign-up bonus when you confirm your e-mail, essentially making it $25 at first. Again, if you’re active, it really isn’t that hard to reach this threshold. Signing up is 100% free and only takes seconds to do. Follow the link below for a special sign-up bonus. MyPoints, known as “your daily rewards” program, is yet another survey-like company that allows you to earn points while completing surveys. They also reward you to watch videos, play games, print coupons, beta test software and even shop at stores you may already be shopping at. Much like Swagbucks, Inbox Dollars and a few others I mention, it isn’t a bad idea to join as many of these websites as possible since many of them work with different research companies. And if you join enough and stay active, there’s no reason you can’t earn more than $100+ a month in free gift cards across the board, including Starbucks. MyPoints have been around since 1996 and is completely free to join. Do you want to have fun and get rewarded in doing so? As the name implies, LifePoints lets you earn points by completing online surveys, anywhere at any time. It’s free to join, and once you accumulate enough points, you can then redeem your points for a variety of free gift cards, including Starbucks if you so choose. Around since 2014, the company has paid out more than $32+ million to its members, making it one of the largest and most reputable survey companies on the web. I love PrizeRebel. So much so, I did an in-depth review on my thoughts as to why it’s one of the best ways to earn rewards, including Starbucks gift cards, on the web. If you’re looking for ways to make money and earn rewards in doing so, then PrizeRebel should be high on your list. In short, PrizeRebel will reward you to take surveys, watch videos, complete simple offers, complete tasks and even take part in their daily challenge. And like many of these options I list here, as long as you log in at least a few times a week, there’s no reason you can’t earn a Starbucks gift card in as little as 24 hours. To sign up for PrizeRebel, visit PrizeRebel.com. If considering, just make sure you fill out your profile in depth to qualify for the most surveys they have to offer. instaGC, much like most of these websites, offers probably the most gift card redemption options, including Starbucks. According to their official website, they have more than 350 to choose from! And, again, since instaGC works like the companies I already mentioned, it could be another one to add to your arsenal if you want to maximize your survey and earning opportunities. Aside from surveys, you can also earn gift cards by downloading apps, browsing websites, completing small tasks and so much more. It’s actually quite diverse. It’s 100% free to join and more than 1.1 million gift cards have been redeemed to date. Microsoft Rewards, yes, officially operated by Microsoft, is an extremely easy way to earn Starbucks gift cards and other rewards simply by searching Bing and completing other simple tasks, such as answering a poll question or even checking out a few pictures. I use Bing Rewards almost every day and consistently earn $5 gift cards monthly, and if you want to learn more about it, check out the in-depth review I wrote in the past. Log in daily, earn up to 50+ points and a $5 Starbucks gift card can easily be yours within the month. If you don’t like the idea of completing surveys, then this probably your best option on this list, but again, don’t plan on making more than $10 in a month, even if you’re very active. Yet another company that rewards its members by completing surveys, Harris Poll Online offers Starbucks gift card/codes as one of its many options. Open to both the United States and Canada, Harris Poll Online will reward you with points, known as Hipoints. And as per the FAQ, the company does note that these points can add up fast depending on how active you are with the website. Once you earn enough points, you can then cash out for either a Starbucks gift card or from a variety of additional options, including Amazon and iTunes, to name a few. Membership is 100% free and you can learn more about this program by viewing their FAQ or visiting the official website. As of right now, the Shopkick app is one of my favorites when you’re out and about and shopping as usual and want to earn free gift cards for completing extremely simple tasks. And using the app is easier than ever and could be another option if you don’t like the idea of completing surveys. The app is loaded with HUNDREDS of offers right now, making it extremely easy to build your balance. If you sign up, be sure to use my referral code “NICE645299” for an EASY bonus. The app is 100% free to download. Ipsos i-Say lets you share your opinion in a fun and thought-provoking way, all while earning rewards in doing so, including Starbucks gift cards. With so many options online that are similar to Ipsos, they do mention their experience will be different. To date, the company has more than THREE MILLION members and joining is, indeed, 100% FREE. With a very low redemption rate, as little as 500 i-Say points to cash out, it shouldn’t take you long to earn a small Starbucks gift card. Toluna influencers work with some of the world’s most prominent brands, including Amazon, CBS, Fiat, and Kellogg’s, to name a few. And when you sign up, you can help inspire future products from these companies with your own personal opinion, essentially sharing your ideas in exchange for rewards, including Starbucks gift cards. Whether it’s completing a poll, survey, task or interacting on the forum, Toluna offers a variety of ways to boost your points balance, all while having fun. To sign up, you can do so here, and like most of these websites I mention, it’s highly recommended you fill out your profile once you sign up to really capitalize on the platform. If you haven’t downloaded the free ibotta app, I highly recommend you do so as they will give you cash back for just about any purchase you make at hundreds of popular retailers, including Amazon, Walmart, Walgreens, Sam’s Club, CVS, Costco and so many more. Once you download the app, search for a store you plan on shopping at and/or find a store you have a receipt for. If the store is listed, click on it and see how you can get cash back. In some cases, for example, the app will reward you a flat percentage cash back, while in some cases, you may have to purchase a particular item to get your cash back. For instance, if you were shopping at Walmart, you could get $7 cash back if you purchased seven Lean Cuisine frozen entrees. This is just one of the hundreds of examples. Well, once you earn at least $20, you can redeem it for a Starbucks gift card if you choose. Even if you don’t want a Starbucks gift card, you can choose from a variety of other offers or even Paypal cash if you choose. The app is 100% free to download and is an awesome way to get rewarded for the shopping you’re already doing. In the past, I wrote about ReceiptPal in my Ibotta alternatives post, and if you’re unfamiliar with the app, it’s quite simple to use. Any time you receive a receipt, snap a photo and upload it while logged in. Then, once ReceiptPal validates your upload, they will reward you with points, in which you can then redeem for a variety of gift card options, including Starbucks. The app is 100% free to download and may be worth a shot. Just keep in mind that it may take a while to earn $5 or so and accumulate your receipts. Even if you frequent Starbucks once a month, I highly recommend you join the free Starbucks Rewards Program to at least earn “stars” for every dollar you spend. I know this isn’t a free gift card per se, but even if you join and never spend a dime, you can at least get a free drink of choice on your birthday, almost acting as if you had a small gift card. If you don’t feel like completing tasks, that’s fine as there are other ways to potentially get a free Starbucks gift card without much effort, however, like the lottery, it will take some luck. 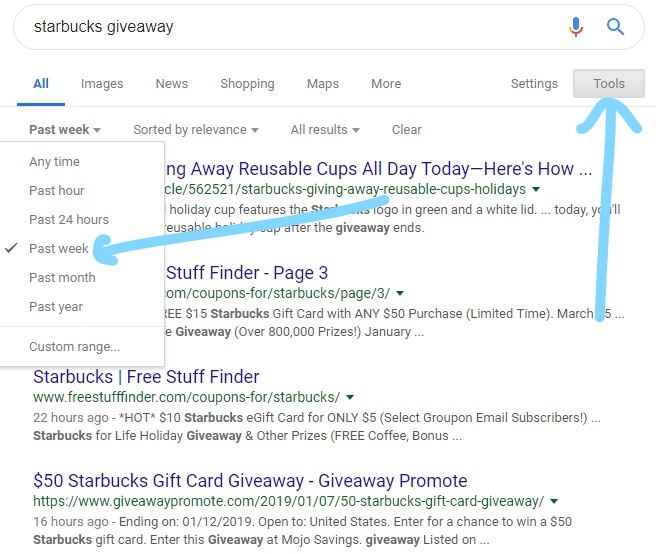 With thousands of contests active every day, there’s bound to be somebody out there who’s giving away a Starbucks gift card, and if you’re wondering how to find these said contests, there are a few things you can do. Personally, I like to make sure I’m looking at the results from the past week. And if you look closely, I was able to a few blogs right away that were giving away Starbucks gift cards! Again, it will take some luck, but hey, the more contests you enter, the better your chances could be, right? Aside from Google, also consider searching Twitter, Facebook and even Instagram in a similar manner to see if you can find any options as well. 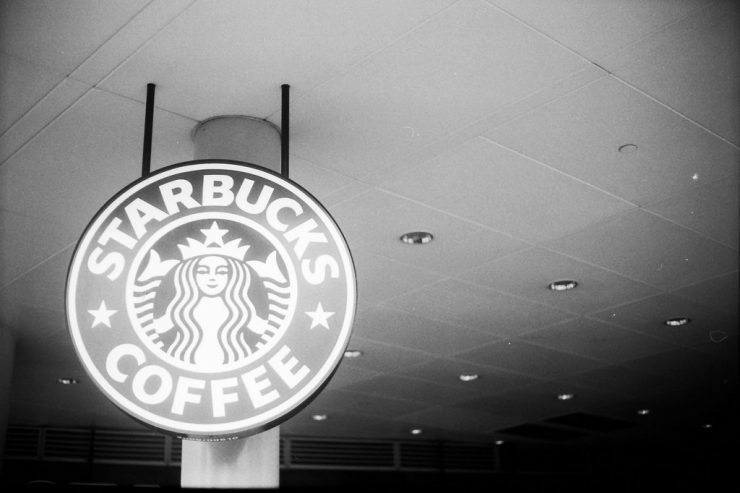 It’s not too uncommon for Starbucks to either offer a free gift card opportunity or partner with another company that does so as well. For example, in the past, if you were part of the GM Loyalty Rewards, you could get a $10 Starbucks just for being a member. Another similar deal, offered by Verizon, gave out a $5 to their customers, too. Unfortunately, these deals expire fast. And yes, in some cases, you may have to purchase a Starbucks gift card to get a free one, but it’s still a free gift card, right? To find these deals, I highly recommend you set up an alert on Slickdeals.net, one of my favorite deal websites and likely the largest online. By setting this alert, you can be alerted the minute the deal hits, allowing you to sign up for the deal before time runs out, which is often the case with a good deal. Next, I would recommend you use the keywords “free Starbucks gift card” or even “Starbucks” just to stay in the loop. The more specific you are, however, the better your chances at receiving an alert will be. Add the keyword, add the alert and choose your method of communication so that you don’t miss out on a potential freebie! As a disclaimer, this doesn’t even come close to being the best credit card on the market, but if you’re desperate for Starbucks drinks, new applicants often receive bonus stars just for applying and getting approved. For instance, while I was writing this, you could receive 4,500 stars, enough for 36 free drinks, if you spent $500 in your first three months, but again, this could change. The credit card does have an annual fee, so only consider this credit card if you think the annual fee is worth and you will actually take advantage of the credit card rewards. But again, to me, it isn’t worth it, and I only wanted to mention it as it is a way to get a load of free drinks if you meet the minimum spending requirements and the bonus was available at the time of applying. 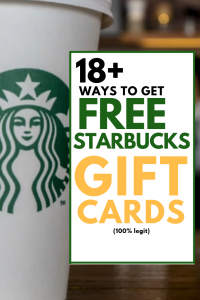 So if you’re a big Starbucks fan, there are ways to snag a FREE gift card; however, as we all know, nothing comes easy in life as it will take a pinch of work. But regardless, if you’re willing to invest 10, 20 or even 30 minutes of your time to complete some simple tasks, it will take no monetary investment on your part — only some of your time. Again, as much as I would like to say, “Give me your name and e-mail and I will send you a code,” the Internet just doesn’t work that way, so if you do see someone claiming such, it’s probably too good to be true. So don’t fall for the spammy Youtube videos or the fraudulent Starbucks gift code generators. They DO NOT work. There you have it. 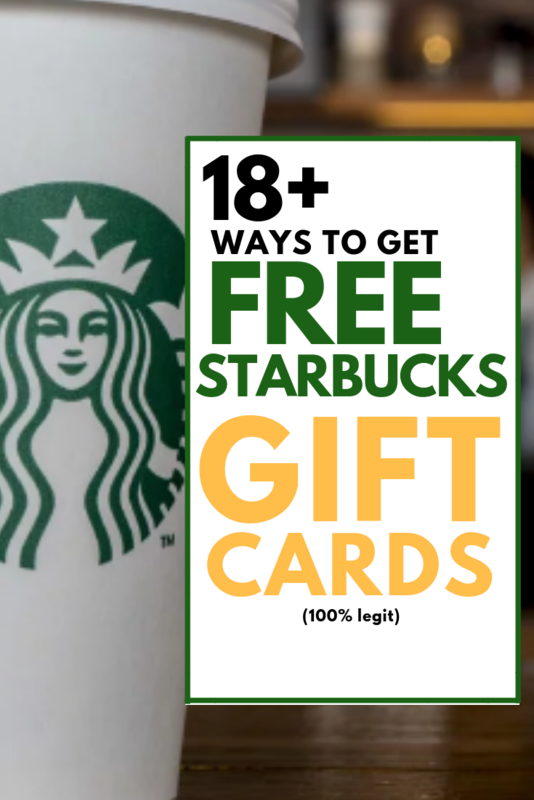 18+ ways to legitimately earn free Starbucks gift cards. If you know of any I’m missing and/or have you tried any of the companies mentioned above, let me hear your thoughts in the comments below!